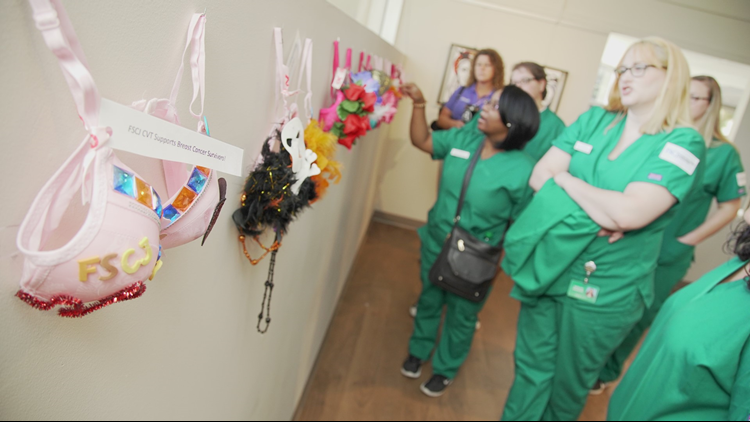 JACKSONVILLE, Fla. -- Thank you to FSCJ students and faculty for creating some clever and beautiful Buddy Bras to help us purchase the Buddy Bus, a mobile mammography unit for six local counties. It's our new project with Baptist/MD Anderson Cancer Center. Each Buddy Bra is a $20 donation towards the project. We need to raise one million dollars to buy the Buddy Bus. Right now less than 50 percent of women get regular mammograms. That's sad, considering a mammogram can detect precancers as tiny as grains of sand. Monica Franklin, Jill Johnson and others organized the effort with students from nine programs at FSCJ. Those programs focus on medical training: Cardiovascular Technology, Physical Therapy Assistant, Ophthalmic Technician, Health Information Technology, Medical Laboratory Technology, Histologic Technology, Radiation Therapy, Dental Hygiene, and the Deerwood Programming Board. It's great to see students pursuing careers in helping people reach out with enthusiasm to help us save lives. Applause to FSCJ! All donations are tax deductible. If you'd like to donate, click here.